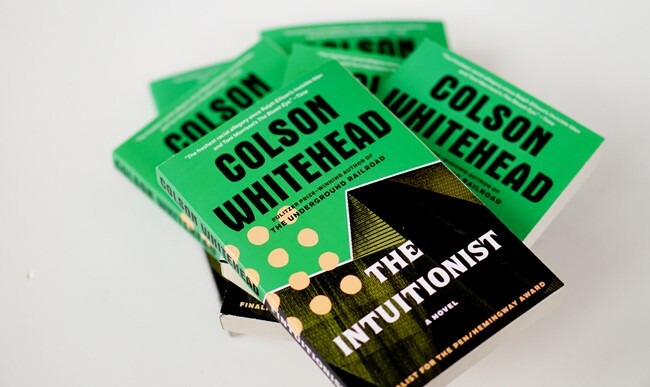 This semester, we’re reading Colson Whitehead’s novel The Intuitionist (1999), where we’re focusing primarily on Whitehead's word usage and phrasings. That is, we’ll focus less on the plot and concentrate more on responses to the words and style of sentences. The Intuitionist is a good novel to think about when it comes to language, because Whitehead displays such an expansive vocabulary. Think about the words that you regularly use in conversation and written compositions. Now, consider this: if you had a larger much larger vocabulary, what do you think you would be doing that you are not currently doing? Why would a larger vocabulary be allow you to do that thing? If I had a bigger vocabulary in words I feel like I would be challenging more people with my word flow and seeing if I can confuse them just by the words I were saying. I feel like a larger vocabulary would allow me to do this because majority of people wouldn't know the words or meanings to the words that I am saying so I feel it will confuse them and make them look at me kind of funny. I would use a larger vocab, especially in words, to enhance my writing as I see that would be useful when writing up to higher officials. I feel like it would not have a large use in communication for me as I want people to understand what I am trying to explain whereas many meanings can be lost to those who have not previously learned the words. A larger vocab would just mean more of a variety of choices for which words that I would pick due to having more knowledge of words in general. If I had a larger vocabulary, I would have more freedom in writing. I would have a lot more choices in how to word each sentence so it would portray exactly the image I want it to. The less options you have in word choice, the more you will have to compromise on your imagery. If I had a much larger vocabulary I would probably be telling more in depth stories on a day to day basis and better explaining myself, whatever my point may be. This is because I would have more specific words to choose from for every idea that comes to mind as I'm speaking to people. People would probably see me as just that much more witty or perhaps understanding. I think it's important to note however, as useful as an increased vocabulary may be, for many reasons it's not as attainable a thing for all people to acquire and those people can make up for their lack of knowledge of dictionary words with their own unique speaking style using emphasis, slang, etc. Having a larger vocabulary would only help me in writing. Knowing more words help you stay away from using the same words over and use synonyms instead. As well using an expanded category will make me seem more educated as well. I wouldn't speak with the vocabulary regularly only for professional reasons because people are use to regular syntax and diction as well slang words. If I had a more expansive vocabulary, I would use it to make my papers more interesting. I would never say or write anything in a boring manner again. I would also use my vocabulary to confuse people with large and complex words. The more you know, the more you know. A larger vocabulary provides a deeper understanding of the world by connecting what we already know with what we just learned. When covering abstract concepts in music theory or ancient Greek songs in music history, I rely upon my ability to draw connections order to wrap my head around the subject. In short, I make metaphors. If I had a more robust vocabulary, I’d make more. If I had a larger vocabulary I feel like i would use it to word things more accurately so that there are no misunderstandings. A vast vocabulary can also help me understand topics on a wide scale and allow me to say the same thing in a more unique way as opposed to saying something with just an average vocabulary. If I possessed a bigger vocabulary, I would be able to express myself in words and in writing much better than I currently can. A bigger vocabulary would also increase my knowledge exponentially because I would be able to recognize and understand words better than I can right now. It is crucial that everyone tries to expand their vocabulary, to increase their intelligence. If I had a much larger vocabulary I would use it to make my writing better in my classes and really try to surprise my professors with my extremely expansive word choices. I've always wanted my English teachers to have to come up to me and ask me what a word means because I have always had to do that with them. Having an extremely large vocabulary would also allow me to understand more words that I come across in my readings. It would be really cool to just have that word knowledge. Not to brag, but I believe my vocabulary is pretty extensive. Having a vast vocab. allows you to present yourself as someone with a higher education. Just presenting yourself well can be the start to many opportunities which can lead to much greater success. With a larger vocabulary I would be capable to do a lot better in my essays. I believe this because my essays would have more variety and sound much more intelligent. This only could be done with a larger vocabulary since you need variety. I felt as though my vocabulary was already somewhat large but reading this book has helped me to realize that there is always room to improve and gain more knowledge. I had to look up several new words when reading through this story and it has allowed me to increase them to my vernacular. As I said I like to think my vocabulary is pretty good already and there is nothing that I use it for other than to converse and to understand readings and writings better through understanding all the words. Gabe G.
If I had a larger vocabulary, I feel like when it comes to writing essays I would be able to do much better. I would be able to get my points across with better understanding of words. It would also help me when talking to others I would be able to be more articulate in expressing myself. If I had a more expanded vocabulary I would be going into journalism specifically sports journalism.